Jane Hardy at Peter Insull's Yacht Marketing asks me to mention that their joint central agency for sale with International Yacht Collection, Trinity's 49.07m Blind Date is a finalist in the best semi-displacement motor yacht over 40 metres category at this year's World Superyacht Awards. Says Jane: "Blind Date was delivered in late 2009 to her proud owner who insisted on personally conducting tours of the superyacht during the Fort Lauderdale Boat Show. All who looked around her agreed that the expertise of the owner's build team of captain, engineer, Patrick Knowles Design and Patton Marine's Dan Robsham, along with the sage advice of Peter Insull, was evident in the finished yacht which exceeded the owner's expectations. 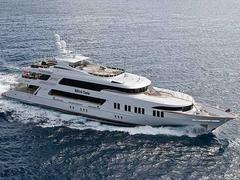 He hopes that the judges of the World Superyacht Awards will agree!" Blind Date is also offered for charter by Peter Insull's, currently based in St Maarten, and is for sale asking $36.25 million.